There’s a video on this blog. She was ignored and didn’t seem organized according to Felix. Well, now that headline is pure bs. Disappointing. I was hoping that she'll play the thrifty card and re-use the engagement dress but maybe it was a loaner after all... R&R has a wedding gown called duchess and I'm pretty sure she went with them for the dress. Another disappointing thing is - she reads on blogs that royals don't wear pants and boom she wears pants, she reads that the classy thing to do is wear pantyhose no matter the season and boom - she wears none. It's ... unoriginal and boring. I saw photos from this event last year and from what the women were wearing I expected a cocktail dress on Megs and not an evening gown as people had wished. But a pantsuit?! She has done some research, she knew to wear Alexander McQueen like Kate. All the designers to put on the map and they keep going to the same ole. So didnt she have to leave uk to ask for a visa?? I suspect that she already had the 'fiance' visa before they announced the engagement. She can also apply for that visa, and the spousal visa, in the UK if she is already there. For once, Meggles is not clinging to Harry's arm. Perhaps we can thank the umbrella for that. Same. All the pics I've seen he's also walking a bit ahead of her. He looks over it IMO. I actually like the outfit but then I like pantsuits on most women. As long as it's fitted correctly, they're the same as on men in my book: hard to go wrong. Still, would've been nice for her to wear a nice dress to the event. Or at least a more jazzed up suit or something. 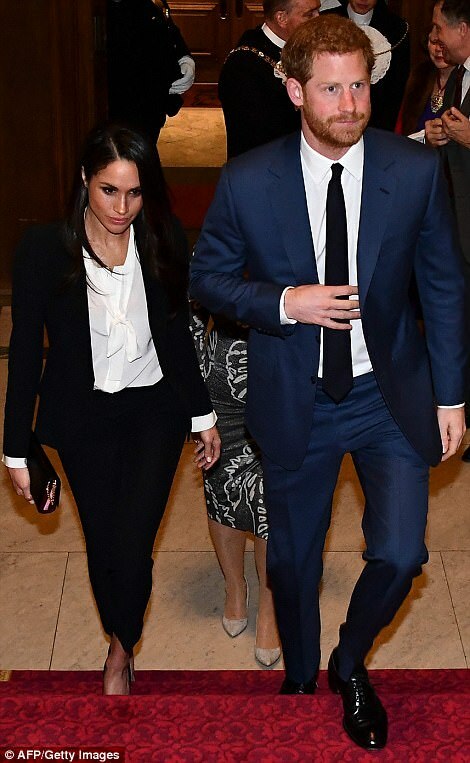 Meghan too wore black last night with a version of a man’s tuxedo teamed with a crisp white shirt with a bow by Tuxe costing £285 and an Alexander McQueen suit priced at £1,245. There's a video in the article where she's assisting a vet and something goes wrong. I'm not sure if she was rude to the vet as some say or she was nervous or just board being there. There was a little snafu during Meggles' presentation yesterday. No big deal, really. These things happen. The reason I'm posting the link to the video is because of the HAIR!! The constant touching, pushing back, etc. Diana, thankfully, had beautifully styled short hair, Anne always wore hers in the chignon, Sarah had long hair, but I don't remember her hair taking over as Kate's and Meggles' does. She looks so much better than Kate. ^She doesn't sound any better. ^^Thats not how you earn your Public Speaking Barbie Badge, Sparkles. She had one line, just one, yet she still had to keep looking down, talked too softly/fast and with humped shoulders. She's either the worst actress in the world or the best and has decided on helpless kitten as her persona. Don't care for the suit for this event and am sick of the black and white color spectrum. She looked like she stepped out of an Ann Taylor window display on her way to a job interview at an accounting firm. Each public event she goes on with Harry, the more incompatible and miserable they look. She’s lost weight and looks old and messy since the “engagement.” I’m sure she dreamt of attending posh parties and hanging out with the posh set at private clubs like Kitty Spencer and Beatrice did last night, but instead she’s going on events that deal with the regular ordinary commoner with real problems that needs to be helped. I hope that this does end soon. The situation’s just sad and pathetic now. ^It all has become pathetic and desperate to me. I struggle to build up any level of caring about anything that she does. This event seemed heavily shielded vs her previous two gigs that cartwheeled all over the place so a level of containment has already been advised, I bet. Those who dislike her whole performance, unfortunately, will spill over into her chosen causes. And the BRF knows it; they’re not stupid so this more constrained event speaks volumes to me that there are concerns behind the curtain. It won’t get any better, either, and I do wonder how this restrictive life will meld with Sparkles’ belief that she is the moral compass for the less enlightened. This is not someone that will stay quiet willingly. ^Do you really believe she would leave the goodies and bolt after marriage? I do. 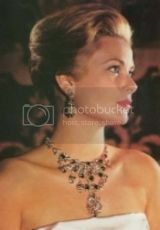 I think as soon as the first anniversary passes she will be on the first gulf stream offered along with enough money from the divorce to last her a dozen lifetimes as well as any jewels she can heist. This event seemed heavily shielded vs her previous two gigs that cartwheeled all over the place so a level of containment has already been advised, I bet. I did notice that Megs didn't look at the cameras, she was very subdued. Had the "Grey Men" descended on her behavior? ^ I get what you are saying. I know this is not the astrology thread but she has in her chart and Independence that allows things. that has been her pattern. In this case she got the prize and she will milk it for what she can get before she bolts.